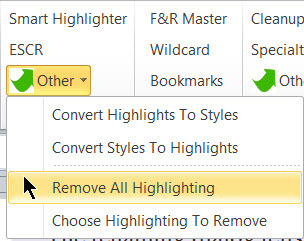 Part I introduced the preediting steps (Steps 1 to 3). Part II discusses the remaining two preediting steps (Steps 4 and 5) and then discusses the first editing step (Step 6) in my editing process, which is editing the references. Most of the projects I work on have extensive reference lists. Sometimes a chapter will have a relatively short reference list of 50 or so, but most are at least 100 references, and sometimes are more than 1,000 references. 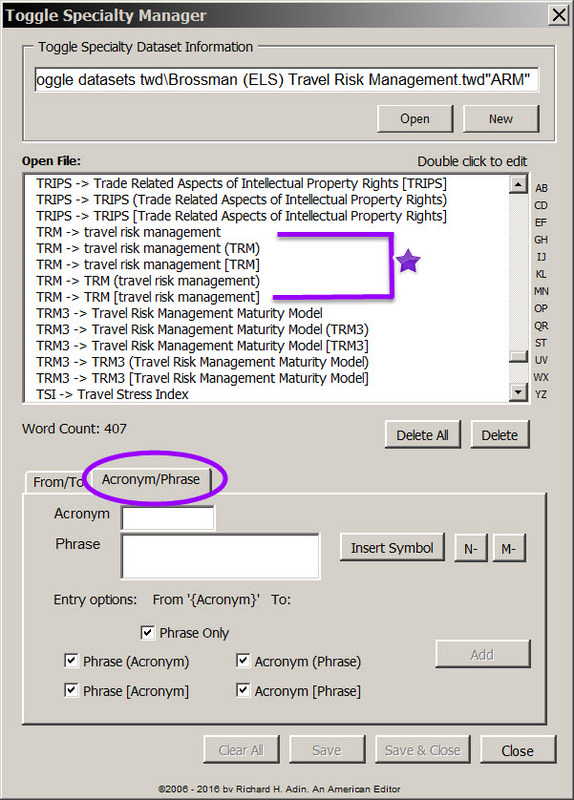 After the preliminary steps and before running Never Spell Word (Step 5), I move the reference list to its own file. I do this for several reasons. First, some of the macros that I use during editing can affect the references, creating undo work for me. Moving the references to their own file avoids this problem. Third, I want to be able to run my Journals macro unimpeded and as quickly as I can. The more material the Journals macro has to run through, the longer it takes to complete. Fourth, I want to be able to run Wildcard Find & Replace on the references without having the macro also affect other parts of the document. And fifth, moving the references to their own file makes it easier to check text reference callouts against the references because I can have both the primary document and the references open concurrently and on different monitors. 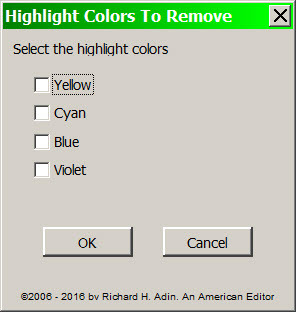 I do not edit the references in this step; I simply move them to their own file. 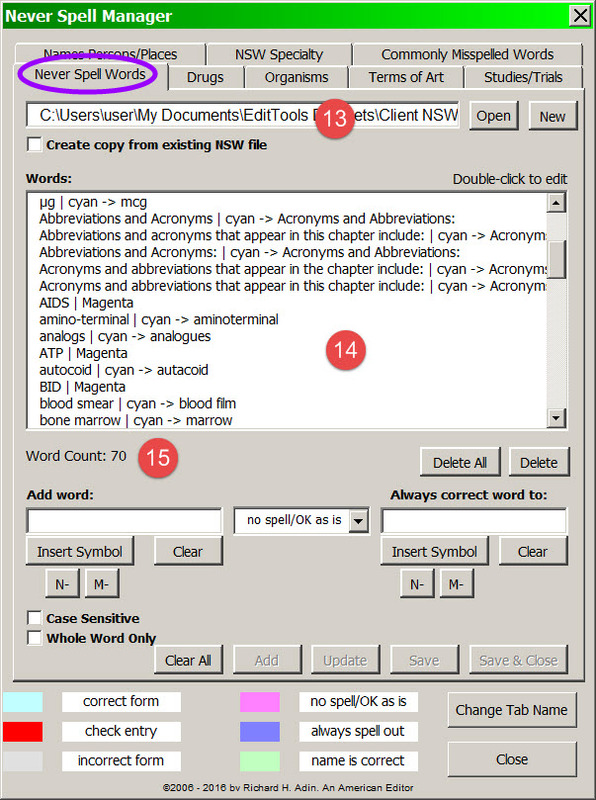 The next preedit step is to create my project-specific Never Spell Word (NSW) dataset, which is shown below. Every project has its own NSW dataset (#13). The only time I use a previously created dataset is when I have edited a previous edition of the book. I assume that word usage decisions made in previous editions will continue in the current edition. This is generally reinforced when the client also sends me a copy of the stylesheet I prepared for the prior edition (or tells me to use it, knowing I have it available on my website). I do, however, go through the NSW dataset to make sure there are no changes that need to be made as a result of changes in the applicable style guide or in other pertinent guidelines (e.g., changing over-the-counter and OTC to nonprescription). 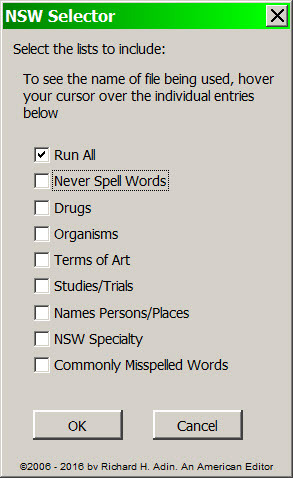 If I cannot use a previously created NSW dataset, I create a new one using the Never Spell Word Manager shown above. 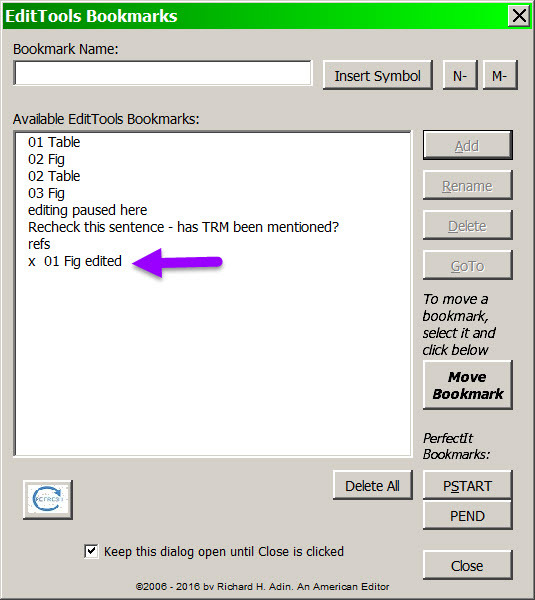 Note that when I speak of the NSW dataset, I am really speaking about the one tab in the Manager — the Never Spell Words tab (circled). 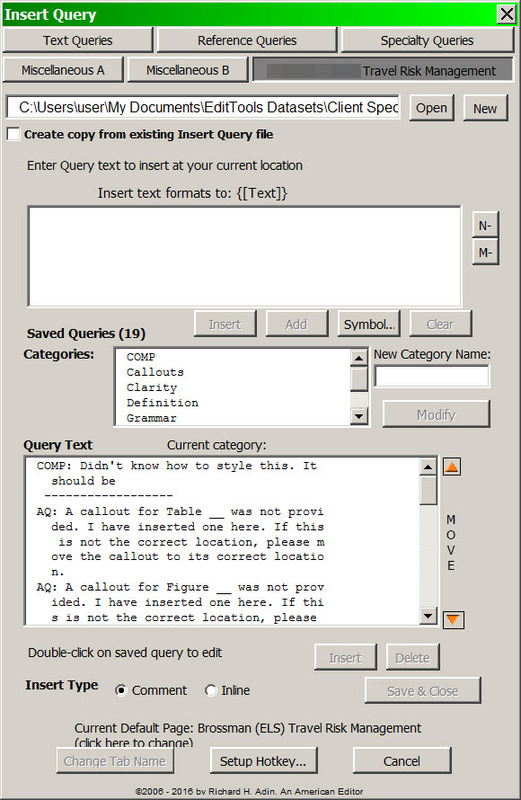 Although the other tabs are part of the NSW macro, they are not project specific as I use them; however, they can be project specific, as each tab can have multiple datasets, and the tabs also can be renamed. In the example NSW, the dataset has 70 items (#15). 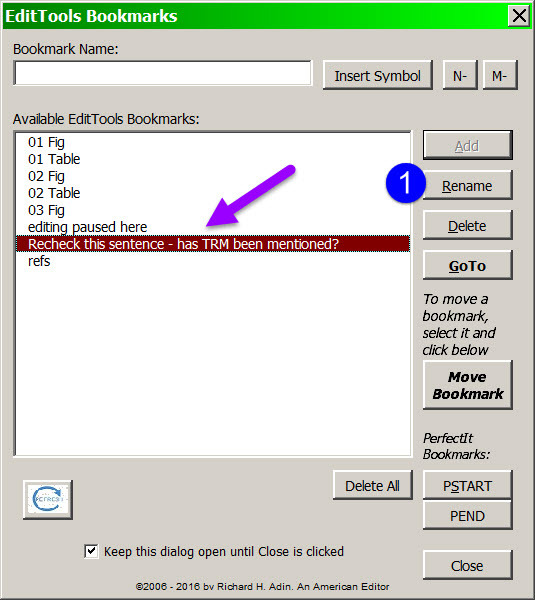 These items were specifically mentioned by the client or the author(s) (e.g., changing blood smear to blood film, or bone marrow to marrow) (#14), or things I noticed that will need changing (e.g., changing Acronyms and Abbreviations that appear in this chapter include: to Acronyms and Abbreviations:) (#14). As I edit and discover more items that should be added, I add them through this Manager. 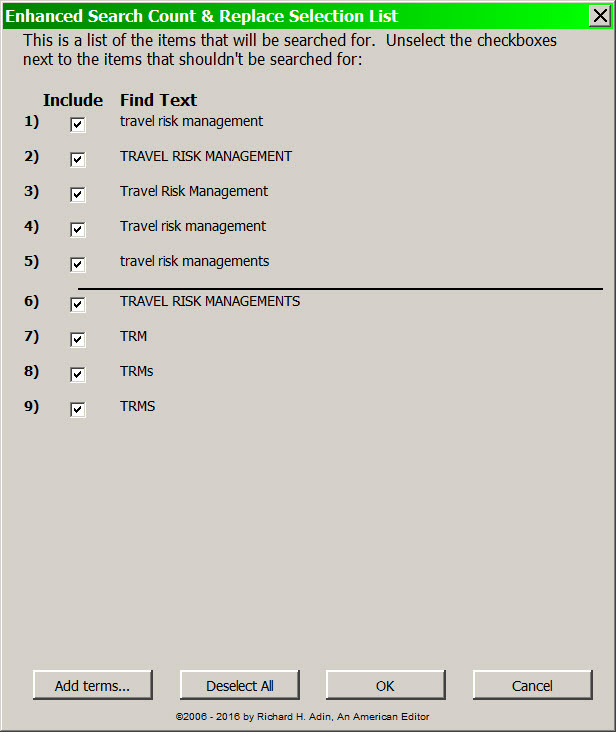 The NSW macro has multiple tabs, some of which may not be relevant to the current project. Running the NSW macro brings up the NSW Selector, shown below. Here I choose which tabs to run. The default is Run All, but if I need to run only the NSW and Commonly Misspelled Words tabs for the particular project, I check those two and click OK and only those two parts of the macro will run. After the NSW macro is run, it is time to begin editing. 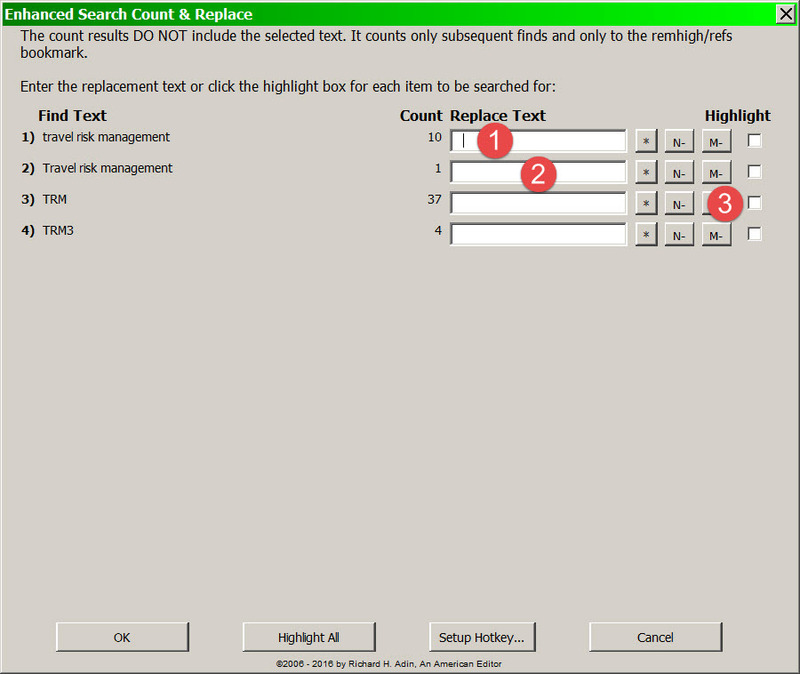 My first task is to edit the references that I moved to their own file in Step 4. 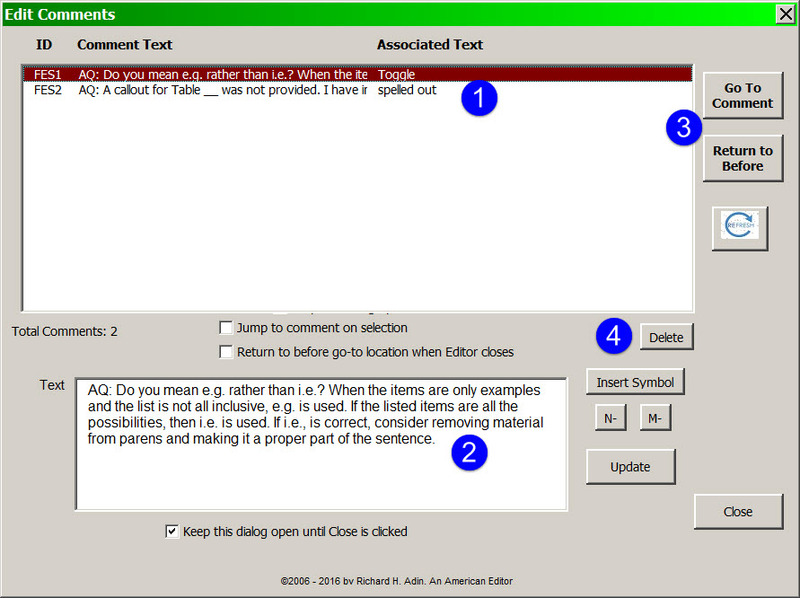 I deal with the references before editing the text so I can determine whether there are “a,b,c” references (e.g., 57a, 57b) or if the references are listed alphabetically even though numbered. 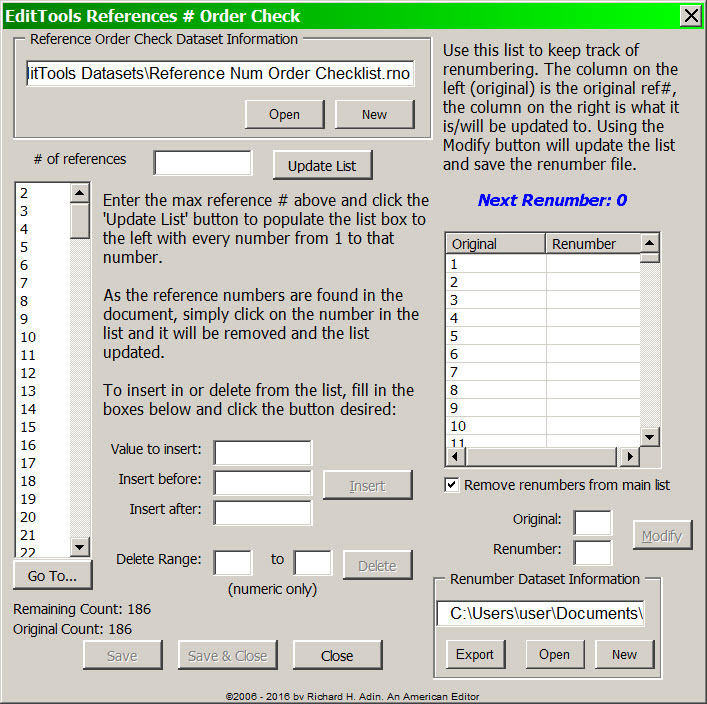 This is important to know for setting up the Reference # Order Check macro, found on the References menu and shown below, for tracking callout order and for renumbering if needed. After I set up the Reference # Order Check macro, it is time to look at the references and see if the author followed the required style. Occasionally an author does; usually, however, the author-applied or -created style is all over the place. So the next macro I run is Wildcard Find & Replace (WFR) (shown below) and the appropriate scripts I created using WFR. 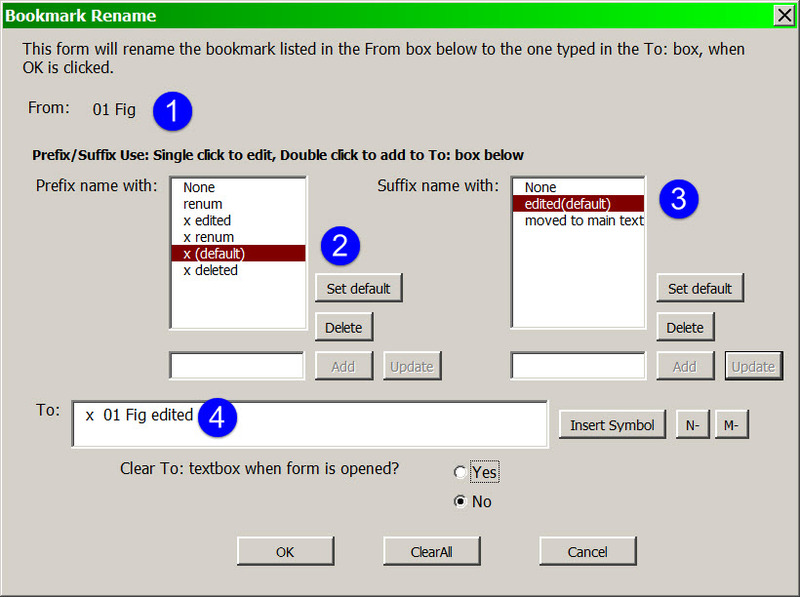 The scripts focus on specific problems, such as author names and order-of-cite information (e.g., year first or last). The scripts cure a lot of problems, but not all of them. Following the scripts, I run the Journals macro. Depending on which dataset I use, running the Journals macro may well fix nearly all of the journal names. After running the Journals macro, I go through the references one by one, looking for remaining problems that need fixing, such as completing incomplete citations. If I come across a journal that was not in the Journals dataset, which I know because it is not color coded, I verify the journal’s name. 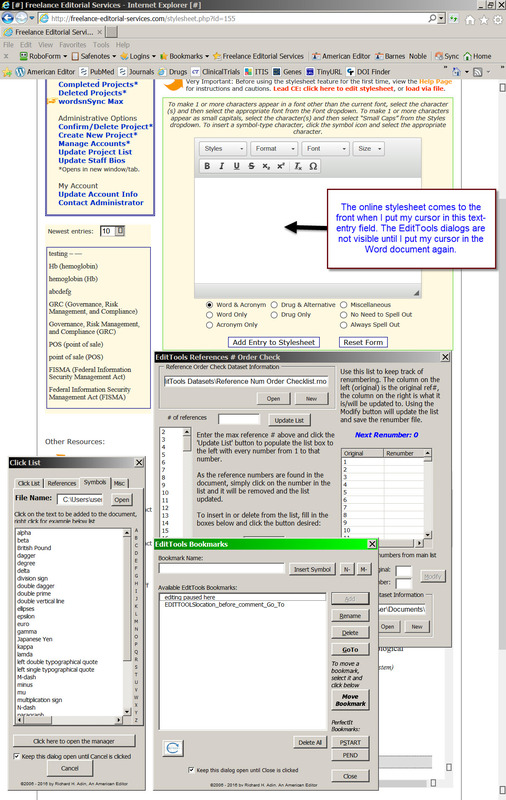 I also go to the Journals Manager enhanced screen, shown below, so I can add the journal to multiple datasets concurrently. Once I have finished editing the references, it is time to begin editing the main text (Step 7), which is the subject of Part III.